Someone needs to have a "come to Jesus" meeting with the weather about that fact and the fact that the entire 10 day forecast is below 70 degrees. Regardless, there are pockets of time in the late afternoon when it does feel a little "spring-ish" outside. And that plus daylight savings time equals the ability to actually get some running in after I get home from work which is awesome. Let me take a moment and brag a little on my sweet husband. Yesterday I was at work and Andrew had the day off with P. While I was at work I got a text from Andrew with a preview of what he had planned for the evening. 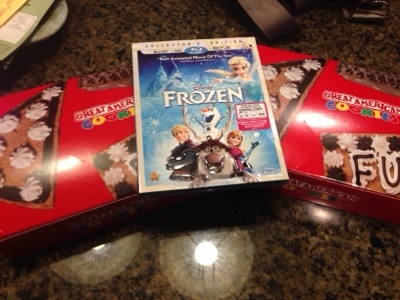 He had bought the movie Frozen on DVD (and Blu-ray and digital copy...which will come in quite handy on a plane flight next month). I wonder what percent of the population already owns a copy of the movie that just came out this week. Based on social media...I would bet that percentage is high. It is sooo good though. Andrew had also bought a couple slices of cookie cake for dessert. Now that is speaking my love language. When I left work, Andrew was headed to the grocery store with P to get supplies for dinner. I was able to make it home in time to go out for a run in the almost-springlike weather while they were gone. Earlier this year, Andrew made a New Years Resolution to cook more on his days off during the week. 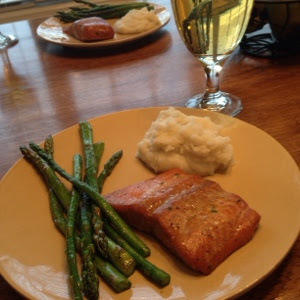 Last night he made an awesome dinner of baked salmon, mashed potatoes and asparagus. It was was really good and incredibly sweet of him. Perry loved dinner too. Well except the salmon. We tried and then gave up and heated him some chicken nuggets. 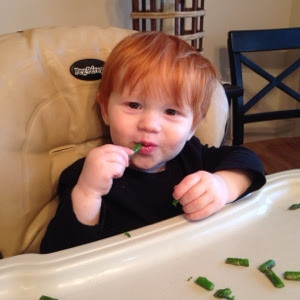 He did love the asparagus...so I will call that a parenting win. After dinner we went for a family walk around the neighborhood (because hey it was still daylight outside), bathed Perry and put him to bed before nestling in with our cookie cake and movie. It seriously was a perfect evening. I am so grateful when we can have fun family nights during the week because Andrew has to work every other weekend which cuts into weekend family time. Another bonus is the fact that I have a little tupperware of leftover salmon, potatoes and asparagus in the fridge for lunch today. Sadly no more cookie cake...we ate all of that last night.